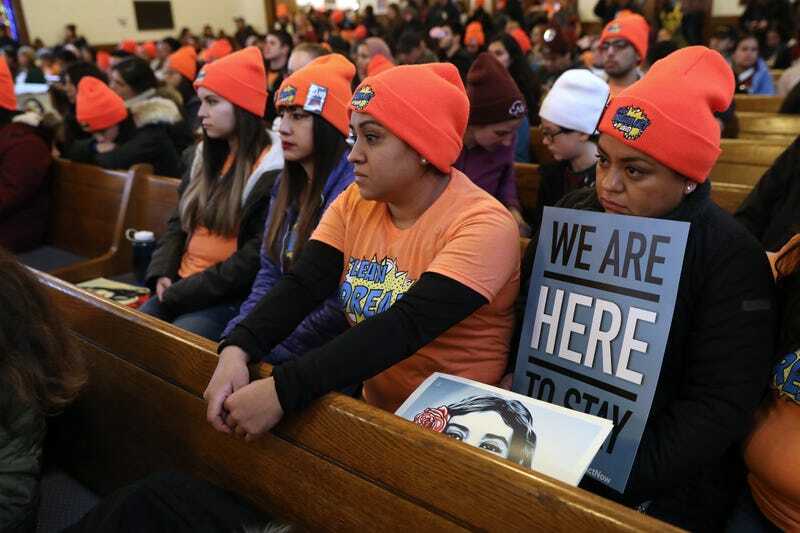 Immigration activists take part in a National Day of Action for a Dream Act Now protest on Feb. 7, 2018, in Washington D.C. The U.S. Supreme Court on Monday declined to immediately review lower-court decisions that keep the Deferred Action for Childhood Arrivals program from going kaput, in what has to be a huge relief to DACA recipients, and is yet another blow to the Trump administration. The DACA program gives at least 700,000 young immigrants a path to U.S. citizenship. Recipients are often referred to as Dreamers, based on proposals in the never-passed DREAM Act in Congress, which would have provided similar protections for young immigrants. In September, President Donald Trump announced that he would let the DACA program end unless Congress acted to save it—which, given this inert Congress, marked it as good as dead. After Trump’s initial pronouncement to end DACA, a flurry of organizations and states sued the administration, and federal district judges in California and New York issued nationwide injunctions against ending DACA while the cases are being heard. The Supreme Court rarely takes up a case that has not been ruled on by the lower courts, and the Washington Post reports that in the past, the court has done so only when the cases were of “grave national importance,” such as the controversy over President Richard Nixon’s White House tapes or the Iranian hostage crisis. The White House and Congress, in the meantime, can continue to search for a legislative resolution. Good luck with that.